Westminster Press co-founders Tucker Pierce, left, and Nicholas Curry, right. Glimpse through the doors of Westminster Press (3156 Cherokee Street, 806-535-0719) to see pops of color everywhere. Craft pieces cover the DIY rustic-style shelves, and canvases hang from the walls; a varicolored rag doll sculpture sits in a streetside window exhibit. It's a wonderland of hand-wrought goods, purchasable and not, all collected within what its owners call a "gallery, storefront and printmaking studio" all in one. 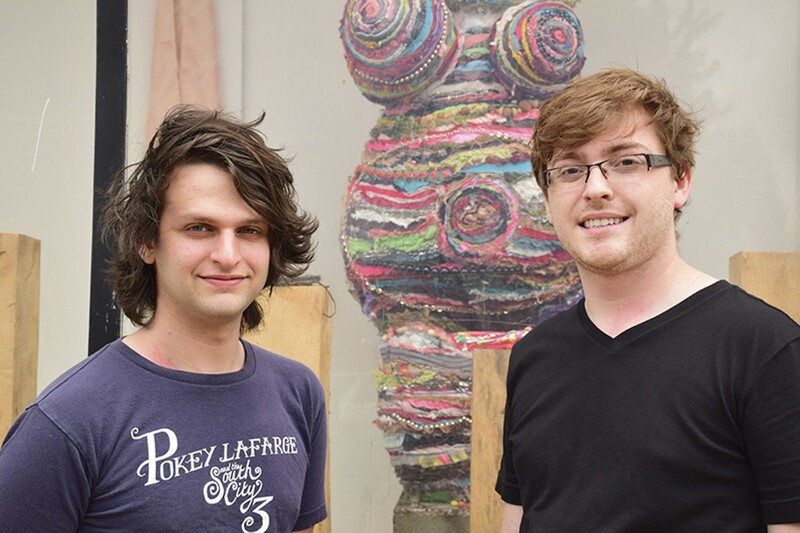 Founders Nicholas Curry and Tucker Pierce describe a goal at once political and artistic: to showcase creators with marginalized identities — artists and craftspeople whose work you might be less likely to see in mainstream galleries. Since opening last December, they've featured "women, people of color and LGBT folks," Curry says. Pierce describes "a community of artists interested in the type of work that engages with their identity, or artists who maybe feel marginalized in traditional art places." Building that community, Westminster Press partners with organizations that have similar goals. They host book clubs for the Meetup group Queer STL and participated in a benefit for Pu Fest. They've also hosted pop-ups for a number of other art collectives. As they grow, they plan to host six to seven shows per year with three to four artists each. "Every show, different people come out," said Pierce. "At the group shows, people bring their community." Their consignment selection takes a broader approach; it boasts wooden birds, metal-worked earrings, vibrant textiles, hand-printed poetry collections and woodblock lamps. This collection is based less on identity and more on works that fit into "maker culture." "There still seems to be a marginality associated with craft itself," explains Curry. "As things become automated and mass-produced, we're losing a lot of these techniques and these trades. We want to focus on the people who are still making things by hand, who still know the old processes and are using them to make beautiful art objects." The consignment items come from dozens of artists. Each purchase gives a little to Westminster Press (allowing its mission to continue), a lot to the artist (for their labor) and something to the buyer — after all, they get a hand-made addition to their household.